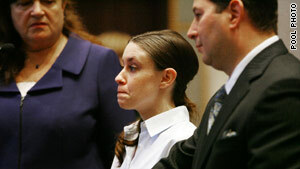 A jury from elsewhere in Florida will be brought to Orlando for Casey Anthony's murder trial, judge rules. Orlando, Florida (CNN) -- Jurors from another Florida community will be brought to Orlando for Casey Anthony's murder trial, a judge ruled Monday. Chief Judge Belvin Perry ruled at a pretrial hearing that the trial will take place in Orlando, but that 12 jurors and six potential alternates will be chosen from somewhere else in Florida. Once they are chosen, the jurors will be sequestered, Perry ruled. Perry also said he will place the lawyers in the high-profile case under a gag order. Anthony, 24, is accused of killing her daughter, Caylee, who was 2 when she disappeared in June 2008. The child's body was found six months later near her grandparents' Orlando home. Anthony's defense had sought to move the trial from Orlando, where there has been extensive pretrial publicity. The defense had pushed for a trial in Miami, where, lead defense attorney Jose Baez said, people are not interested in the Anthony case. "It's history," he said. "South Florida, believe it or not, is one of the best places to seat a fair and impartial jury," Baez said. Baez said when he recently went to Miami to try a murder case, only one potential juror of 60 knew who he was. In another murder case in Orlando's Orange County, nearly every juror recognized him, Baez said. Prosecutors are opposed trying the case in Miami, but have not elaborated on their reasons. The judge deferred ruling on a stack of other motions, most involving what evidence prosecutors can present to the jury. Key among them are to so-called party pictures showing Anthony dancing and drinking with friends at a nightclub and residence in the Orlando area. The defense is trying to keep the photos out of the case, saying they are prejudicial and prove little. But in court Monday, prosecutors said they were interested only in photos showing photos of a "scantily clad" Anthony taken between June 16 and July 15 -- the time period when Caylee was last seen and reported missing. Baez jumped on the words "scantily clad," saying prosecutors' motives were "transparent" and that they were interested "in painting Casey Anthony in the worst light possible." The judge asked prosecutors to narrow down the list of photos they want jurors to see. He said he would rule after holding another hearing on the issue. The judge also delayed ruling on whether jurors can hear the 911 call in which Caylee's grandmother, Cindy Anthony, reports her missing. Prosecutors revealed that there actually were three 911 calls, but they were only interested in playing one of them to the jury. They did not say which one, but the most damaging to Anthony is the call in which her mother says Anthony's car smells like a corpse. On Tuesday, the court takes up defense motions concerning the death penalty.